The 2017 British Applied Mathematics Colloquium started on Monday 10 April at Surrey with opening remarks from the Vice Chancellor Prof Max Lu. The Monday programme had two plenaries: Karen Willcox (MIT) and Peter Grindrod (Oxford), as well as 11 Minisymposiums, and over 50 talks. 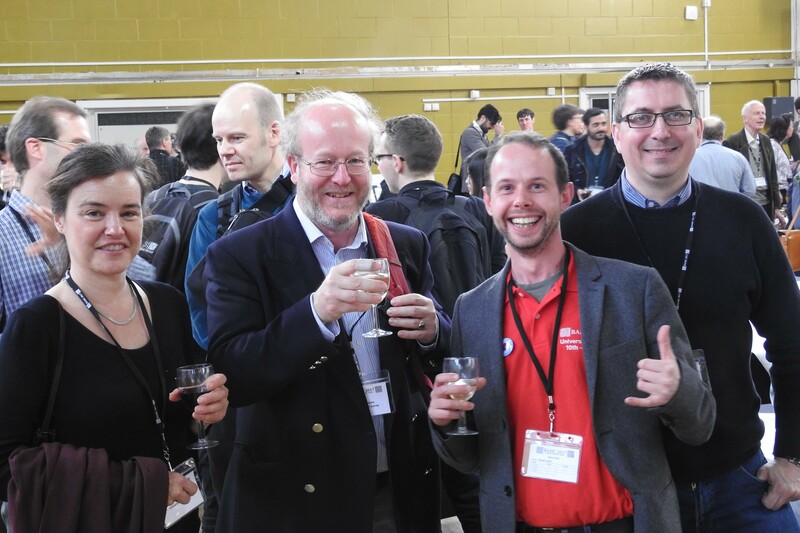 At the end of the day Cambridge University Press organised a Wine Reception and the picture below shows some Surrey representatives (Claudia Wulff, Ian Roulstone, David Lloyd, Matt Turner) enjoying themselves at this event. In the background you can also see Oliver Jensen (Manchester) on the left and John Ockendon (Oxford) on the right.